1. Who responded to our survey? The answer was instant and unequivocal: 70% of people consider it ‘Very Important’ and 30% went so far as to deem it a ‘Life or Death’ priority. Clearly, innovation is viewed as central and essential to the future of business. 3. Who – by job title – is chiefly responsible for driving innovation? 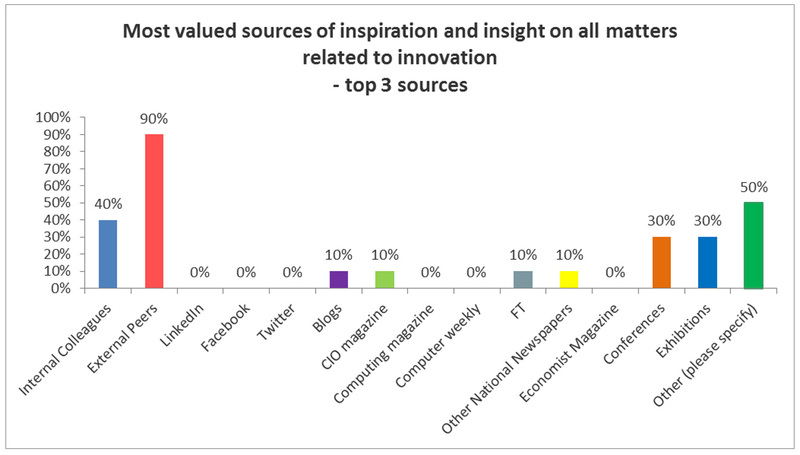 Perhaps most surprising of all, though, was the fact that ‘Heads of Innovation’ were considered to be only the fourth most influential stakeholders. Too many cooks really will spoil this broth. When no single person has a clear mandate to make change happen, it often becomes mired in confusion. By contrast, in organisations where innovation is pursued with real passion, there is invariably one dedicated individual driving it. Actively supported by other senior managers and adequately funded, this person becomes the powerful champion of change. Our message is clear: when you define the role and empower responsibility, you will deliver results. 4. What are the biggest obstacles to embracing and delivering innovation? 5.How would you rank your organisation’s willingness to adopt emerging technologies? This contrast is revealing. It shows that innovation – ‘the implementation of new ideas, the creation of breakthrough products and the competitive improvement of existing services’ – is the ultimate goal for businesses. Concerns about technology selection, suitability and compatibility can create massive senior-level uncertainties. They often cloud decisions and seriously inhibit the adoption of innovation. In truth, though, this should not be a concern. Specialist innovation brokers – such as Clustre – are here to guide organisations through this complex and often perplexing process. Finding the right mix of emerging technology is not an issue – ignoring the need for it, certainly is! 6. What emerging technologies are you trialling – or at least seriously considering – right now? 9. To what type of organisations do you turn to find innovative solutions and services? Peer Recommendations and Internal Teams claimed poll position in the rankings. Accelerators, Systems Integrators and Analysts (such as Gartner) were also highly respected sources. Surprisingly, however, the popularity of Management Consultancies struggled down in seventh place. For years, Clustre has been championing the cause of nimble, niche firms. We believe these agile game-changers are the true artists in innovation. And this survey shows that senior executives also share this opinion. More of them are ‘Likely’ or ‘Very Likely’ to turn to Innovation Brokers – such as Clustre – than any other source of innovation solutions and services. Thank you for this honest vote of confidence. Select one person and give them a clear mandate – and budget – to deliver innovation. When you define their role and empower responsibility, you will deliver results. In the next year, the following technologies will have the biggest impact: AI (including Machine Learning & NLP), Data-driven Analytics, Cloud Delivery/Broking, Cyber Security, Robotic Process Automation, IoT, Automatic Speech Recognition, Mobile Apps and Chatbots. In order of popularity and priority, the most sought-after sources of innovation services and solutions are: Innovation Brokers, Personal Recommendations from Peers, Advice from Internal Teams, Accelerators, Systems Integrators, Analysts (e.g. Gartner) and Management Consultancies. Concerns about technology selection, suitability and compatibility can create massive senior-level uncertainties. So, use a specialist innovation brokers – such as Clustre – to guide you through this complex and often perplexing process. Finding the right emerging technology is not the issue – ignoring the need for it, certainly is!